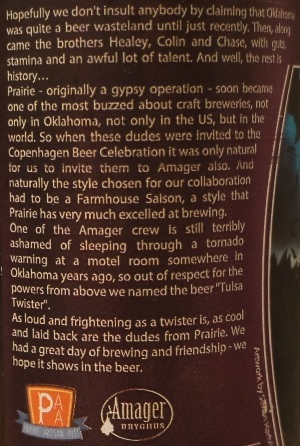 Brewer Description: (from bottle) Hopefully we don’t insult anybody by claiming that Oklahoma was quite a beer wasteland until just recently. Then, along came the brothers Healey, Colin and Chase, with guts, stamina and an awful lot of talent. And well, the rest is history… Prairie – originally a gypsy operation – soon became one of the most buzzed about craft breweries, not only in Oklahoma, not only in the US, but in the world. So when these dudes were invited to the Copenhagen Beer Celebration it was only natural for us to invite them to Amager also. And naturally the style chosen for our collaboration had to be a Farmhouse Saison, a style that Prairie has very much excelled at brewing. 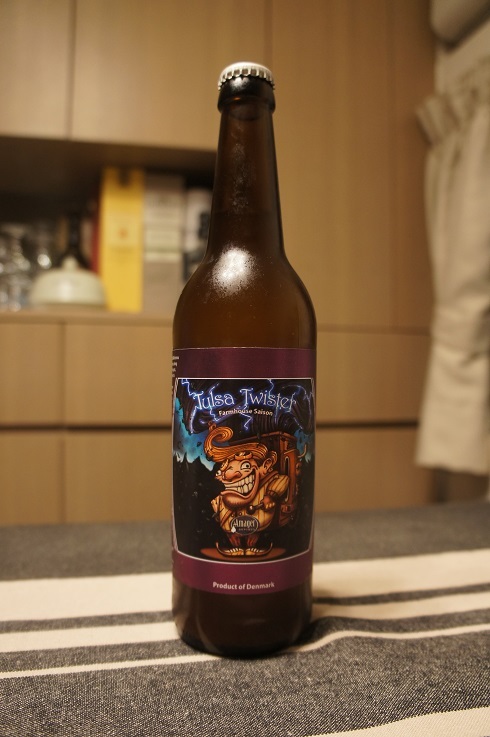 One of the Amager crew is still terribly ashamed of sleeping through a tornado warning at a motel room somewhere in Oklahoma years ago, so out of respect for the powers from above we named the beer “Tulsa Twister”. As loud and frightening as a twister is, as cool and laid back are the dudes from Prairie. We had a great day of brewing and friendship – we hope it shows in the beer. Intro: A 500ml bottle, batch no. 865 with a best before date of September 2017. Poured into a d’Achouffe tulip glass. Appearance: A cloudy golden yellow orange colour with a big fluffy three finger white head that has great retention and left some thick lacing. Aroma: Funky, tropical mango plus citrus orange and lemon. Taste: Funky, grassy, hay, orange, lemon, floral and pepper spice. Mouthfeel: Dry, light bodied with high carbonation. Overall: An enjoyable collaboration between two great breweries. The pepper was perhaps a touch too overpowering, but its still a nice Saison to drink.